As I noted in my previous post, 2018 ended with two tremendous transcription projects: two MasterClasses by Santana and Tom Morello. MasterClass is a new venture that gives the world’s leading professionals in many arenas (cooking, writing, directing, music, and even wine-tasting!) a platform to share their knowledge with ANYONE interested in the form of a “MasterClass.” Awesome. Santana is obviously a living legend, and though I’ve worked with the world’s leading artists for decades now, I was admittedly a bit star-struck as I began working on this material. He has a fascinating world-view and philosophy stemming from his upbringing. I particularly enjoyed listening to his down-to-earth, appreciate your life, musings. It is rare to see artists share this type of content publicly. It was a BUSY 2018, culminating in two huge transcription projects: MasterClasses by Santana and Tom Morello (I submitted around 300 pages of transcriptions for each!!). If you’re not familiar with MasterClass, it’s a new venture that allows the world’s leading professionals a platform to share their knowledge with ANYONE interested. How cool is that?! The first MasterClass project I worked on was for guitarist Tom Morello (of Rage Against the Machine and Audioslave fame). I would highly recommend this for aspiring musicians, professional musicians, and also fans who would like to get to know this interesting artist better. Tom shares not only guitar technique, but also his own philosophy about life and music, as well as why and how he got into the world of music (a fascinating story, by the way). The major challenge for me was navigating the detailed guitar-specific and effect-specific elements of this project. Because Tom’s playing goes way beyond merely playing notes and chords, it was particularly challenging to create clear notation and guitar tablature. In many cases, due to effects pedals or other unconventional playing techniques (such as even playing the guitar CABLE and not the GUITAR), I needed to not only indicate the notes he plays but also the sound that he creates (often on separate staves). What a fun puzzle to solve! here is a thorough review of the Tom Morello course. After nearly two years of work, Samantha Steitz and I published our first book, the Rhythm Keeper. Many of the ideas for this book had been floating around in my head since high school, when I began serious study at improving my own understanding of rhythm and rhythm reading. Back then, I methodically took at least one lesson (in most cases many more) with nearly every drum and percussion teacher in the Portland area. The one recurring concept that the majority of these teachers drove home was the importance of counting and subdividing. I began to grasp the relationships between rhythms in a whole new way. Though counting and subdividing are hardly novel concepts, I came to discover that many of my non-percussionist peers in school and in my youth orchestra did not fully share in the acute understanding of rhythm that my teachers possessed. I vividly recall a young woman in my high school, who once asked me for help in solidifying her own understanding of rhythm, and showed absolute astonishment and fascination with how easy reading rhythms could be when she simply counted and subdivided (she later went on to become a very successful professional french horn player). I let her borrow many of the various rhythm exercises that I had been working on with my teachers. Since these were materials written by drummers and usually only studied by drummers, she found that practicing the material off the instrument yielded fantastic results. Fast-forward a few years, and I found myself assisting my partner, Samantha Steitz, who is an accomplished piano pedagogue, to create various rhythm handouts for her group theory classes. The handouts focused primarily on counting and clapping and on incorporating subdivision to the counting where appropriate. Imagine our mutual delight when, after a year or so of counting and clapping, all of her students showed dramatic improvements in their rhythm, which translated to much stronger conviction in their playing, improved self-confidence, and overall more solid performances. 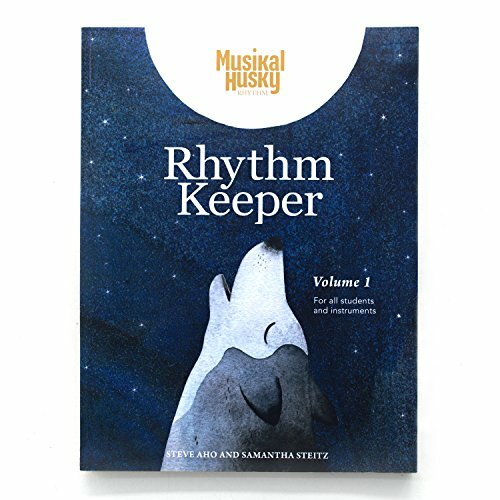 Samantha’s years of experience in music pedagogy, her knowledge of clear and logically sequential presentation of material, and her keen eye for design and beauty all came together with many of the rhythm concepts we wanted to explain, and out of that emerged the Rhythm Keeper. It was awesome to work on the orchestra for The Greatest Showman score with Roger Joseph Manning Jr. and Emile Haynie! Hope you enjoy!! Harry Styles "From the Dining Table"
Surreal that this album is now #1 IN THE WORLD! Harry Styles #1 Album In The World! Pleasure to work on this album, now #1 Album In The World! Last night I had the pleasure of attending a special seminar in Los Angeles given by Daniel Spreadbury demonstrating Steinberg’s new notation application, Dorico. As some readers may already be aware, Avid -- the parent company of Sibelius -- laid off its core team of developers several years ago, and this team was quickly snatched up by Steinberg and given the task of developing a fresh new notation program. The resulting product, Dorico, was released in the last quarter of 2016. Mr. Spreadbury’s presentation last night was outstanding. Despite starting a bit late (LA traffic), a number of very impressive features were demonstrated. Intuitive setup, workflow, layout, intelligence, flexibility and efficiency make Dorico stand out as a very viable competitor to Finale and Sibelius. Dorico’s team has poured their talents into this new software, and their attention to detail, design and execution is invigorating. Daniel Spreadbury giving a presentation of Steinberg's Dorico at the American Film Institute in Los Angeles, January 17, 2017. Score setup is quite straight-forward and logical. Upon starting the program, the user is greeted with the “Steinberg Hub” menu, which, among other options, offers the user a choice of various orchestral, band, choral, musical theater, and chamber music templates. Regrettably missing are templates for big-band, small jazz ensembles, and most other pop / rock music ensembles. Upon selecting a template, a blank score containing a single quarter rest appears on the screen, ready to accept notation input. Dorico features five discrete “modes” for different types of tasks: Setup, Write, Engrave, Play, and Print. You can quickly switch between the five modes with the ⌘(command)+1-5 keys. As a user who absolutely detests reaching for the mouse or trackpad, I love that there is a key command for nearly every action within the program. Although the default commands are very logically laid out and share some similarities to other notation programs I am familiar with, every key command is customizable, and each action lacking a default key command by default can have one assigned to it. However, hovering the mouse cursor over buttons in the user interface does not always display the corresponding key command, which I find to be slightly annoying and hope that Dorico will address in a future update. Inputting notes, dynamics, articulations, lyrics, and other musical elements into Dorico is quite easy to figure out, and once I better familiarize myself with the menus and keyboard shortcuts, I believe input can be done much faster and more efficiently using Dorico than with any of the competing notation programs. The layout looks quite beautiful immediately upon entering notes with virtually no alignment or collision issues. I also tested opening several scores that were exported from other programs using MusicXML and found the results to be quite impressive. One of the first things I noticed when inputting notes into Dorico was the superb sound quality. Dorico makes use of the HALion Sonic SE VST instruments, and their default settings are quite good. Perhaps the days of sending a disclaimer to clients to apologize for a cheesy sounding orchestral mockup may be finally over! Another feature I love is the ability to fine-adjust the parts in piano roll view without affecting the printed notation - very useful for tweaking specific parts to make even more realistic sounding playback. Dorico also supports nearly every third-party VST3 instrument and plugin, and I was pleased to see that all of my third-party VST3 plugins were available and functional within Dorico without too much additional configuration needed. According to Dorico, this feature will be included in a future update. Their reasoning behind omitting this feature seems to have been largely due to the time constraints of the release deadline. Since I work a lot in pop and jazz genres, this missing feature will unfortunately prevent me from being able to seriously use Dorico for the time being. However, I plan to begin training myself in how to use Dorico in anticipation this feature release. Dorico is a very promising, well-designed program, and I wholeheartedly compliment Daniel Spreadbury and the Dorico development team for their hard work. As many Finale and Sibelius users will attest, the increasing need for workarounds and third party plugins to compensate for buggy or illogical behavior in those programs has long been a source of irritation to users. Dorico, while not quite perfect yet, has enormous potential and I believe that it may eventually be the notation program that many of us have long wished for. I look forward to the release of the next update of Dorico and may then seriously consider abandoning Sibelius and Finale altogether. When I heard about the initial release of this plugin last week, I was immediately excited to give it a try, as it brings several much-needed features to Sibelius. Since many notation projects involve importing material from one type of score into another, this plugin can be a huge time-saver and eliminate several tedious steps from the process. The plugin functions to import the structure and various fundamental elements from one score to another. In addition, it transfers tempo markings, time signatures, key signatures, bar number changes, rehearsal markings, system symbols, system lines, and special barlines (double, final, repeat, etc.) from the source score into the template score. In a DAW environment, one might compare this plugin to the "Import Session Data" feature of Pro Tools. But how is this better than simply using Sibelius’s built-in “System Passage” function to select and then copy/paste from the source score into the template? The default “System Passage” function, while useful, doesn’t offer options to selectively omit certain elements from the source score. As a result, this method usually creates a mess of unwanted material in the template score. Tom Curran’s very smart plugin, on the other hand, is extremely customizable and only does what you tell it to do, allowing you to better retain the look of the template score without having unwanted elements imposed upon it. The usage of the plugin is very clearly documented in the Sibelius plugin site and even includes a YouTube video demonstration. Below are several screen captures from the video, showing the plugin being used to import the structure from a piano-vocal sketch into a larger orchestral template. My only gripe with the plugin is its name, which falls a bit short in describing what the plugin actually does. I might have named it something along the lines of “Selective Score Element Import,” but nevertheless it is an excellent addition to the the Sibelius plugin collection and I am deeply grateful to its creator, Tom Curran, for putting in the time to build it. Bravo! A significant part of my work involves transcribing music. Whether it's prepping a live show for an artist, making charts for a recording session, or transcribing an entire orchestral score, the basics of my transcription process remain essentially the same. The primary goal is to create error-free parts and scores that are clear and easy to read. It goes without saying that in order to properly notate music, one has to have proficiency in music theory and music notation, and must be able to recognize rhythms, pitches and chords. Beyond that, an understanding of each instrument's respective ranges and capabilities is needed to correctly notate its parts. I do most transcriptions in a two-window environment: source audio on one side, score on the other. Often, I will tile the windows to accommodate whichever application requires the most space. On a Mac, I use BetterSnapTool to neatly place each window just where I want it and to maximize screen real estate. On a PC, the OS has similar functionality built in without the need of a third party add-on. I find it extremely helpful to put my source material in a multitrack audio program such as Pro Tools, Logic, Cubase (my DAW of choice for this is Cockos Reaper). This enables me to quickly tempo-map the source audio and establish the form, exact number of bars, location of beats, tempo changes, and meter changes. Having all of this information laid out visually in a grid makes it easy to create a transcription that has the correct number of bars. THIS DOES NOT NEED TO BE A COMPLEX, SAMPLE-ACCURATE TEMPO MAP. I will be publishing another article on advanced tempo-mapping techniques soon. Learn to navigate within your DAW with keyboard shortcuts. It is a huge time-saver to be able to skip back one bar, forward two beats, or to advance to the next chorus -- all without having to touch the mouse. In many DAWs, you can even create your own custom keyboard shortcuts to further reduce the amount of wasted time and mental energy spent hunting through your source audio. Q: DO I NEED TO MAKE A TEMPO MAP IF THE MUSIC IS REALLY SIMPLE? A: It depends. If the music has a perfectly steady tempo, then you just need to determine the initial tempo, form, number of bars, and location of any time signature changes. Often, however, tempo-mapping out a simple-sounding song will reveal that it has a cleverly inconspicuous 2/4 bar or an unconventional form. Q: IT'S TOO HARD TO CREATE A TEMPO MAP FOR THIS PARTICULAR PIECE BECAUSE THE TEMPO KEEPS CHANGING AND THERE ARE LOTS OF HOLDS. WHAT DO I DO? A: Learn to do it. It's worth it. It is especially important when working with music that has numerous tempo changes to determine where the beats and subdivisions are. Without doing this, you have little hope of creating an accurate transcription that a performer would be able to play. Although I admire the beauty of hand-written music, its limitations with regard to revisions, scalability, and error-checking make it impractical for my purposes. Though I used Finale for many years and still maintain proficiency with it, I now prefer to work in Sibelius. Just as with the audio sequencer, it is essential to master the keyboard shortcuts of the notation software. I use a number of custom keyboard shortcuts to further streamline my workflow. Finale and Sibelius come with many useful ready-made templates that can make your score look clean and professional. I have also created a number of my own templates to help me avoid needing to rebuild scores for instruments and types of ensembles. I avoid the fonts and templates that mimic handwritten charts, not only because I find them ugly, but also because the text can be hard for players to read in poor lighting. Making a good transcription is part listening, part deductive reasoning. Transcribing music is more than just "hearing" what is in the recording. The focus must be on the more important information, while filtering out what is less relevant. The reality is that instruments are not always perfectly in tune; sometimes passages are not executed clearly; sometimes musicians play ahead of- or behind the beat; and sometimes the recording's mix makes it impossible to pick out what certain players are doing. In all of these cases, a good transcription is one that most accurately depicts the intent of the music and will then enable whoever will be playing the transcription to re-capture that intent.